The Division 2 may be the most pleasant "road to endgame" experience that I've had in an online game. I've dropped 60+ hours in Ubisoft's version of a Washington D.C that has fallen into chaos and anarchy, but it keeps calling to me. It's the kind of game where you'll tell yourself, "I'll just peek around the corner and log off," only to find yourself hip deep into several missions an hour later, backed by a silent squad of two players. The Division 2 picks up seven months after the events of the first Division, where the United States collapses after the outbreak of a deadly virus. Gone are the snowy streets of New York, replaced by Washington D.C in the summer. As a native, I can tell you that it's already unbearably muggy in June, and The Division 2's slow encroachment of forests and swamps is probably not making things any better. 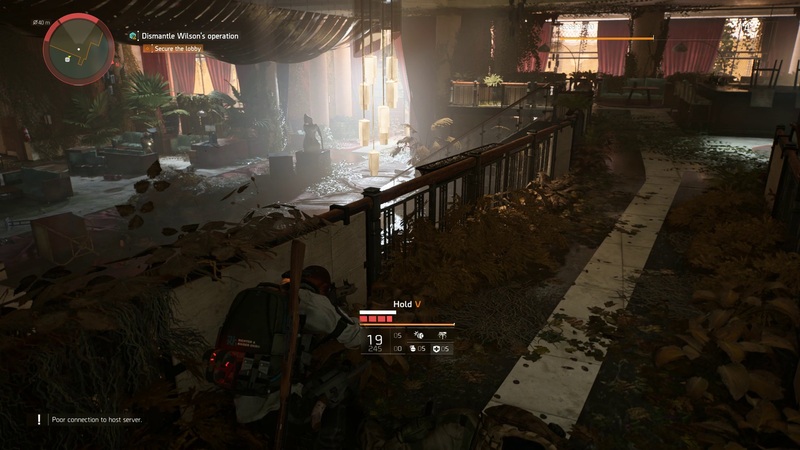 While The Division's New York dealt with the immediate aftermath of the viral outbreak, The Division 2's D.C. is beginning to adjust. There are gangs, sure, but there are also pockets of peaceful civilization that you need to protect. My biggest problem with The Division 2, an issue also present in the original for me, is that it's not all that interesting aesthetically or mechanically. Given the choice of playing a game, I tend to think that the further out you get from reality, the better. I prefer Halo to Call of Duty, Middle-Earth: Shadow of War to Ghost Recon Wildlands. I'm not necessarily in the "Tom Clancy" wheelhouse. Military gear and guns definitely appeal to a certain demographic, and I'm busy looking for mech, magic, and far off locales. The cover shooter isn't the greatest selling point either. If you squint, The Division 2 feels a lot like Ubisoft's own Ghost Recon Wildlands, a game I enjoyed, but one that wasn't one of the standouts of 2017. The Division 2's moment-to-moment play isn't amazingly exciting. You park yourself behind waist high walls and take shots at the enemies that pop out from behind cover. Anthem may have failed in the fundamentals of loot shooters, but you can't say that flying around its immense untamed world in an exosuit wasn't interesting. For me, The Division 2 has to overcome its own foundation, because it's one that doesn't appeal to my interests at all. 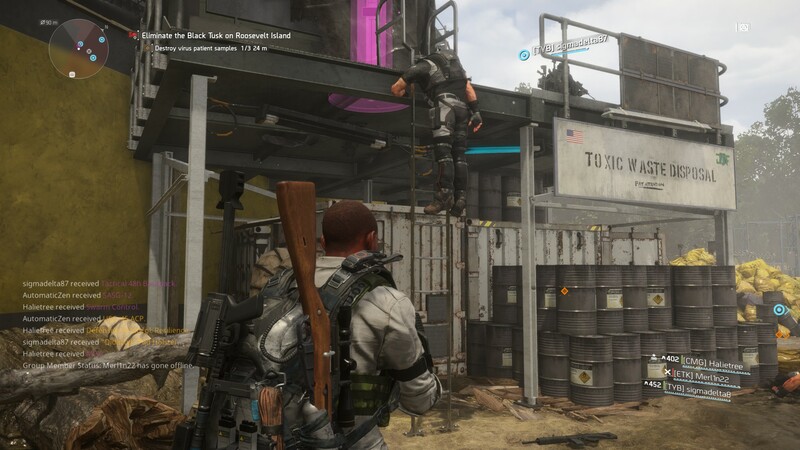 And yet, The Division 2 has its hooks in me. I also found the narrative of The Division 2 to be almost non-existent. Your unnamed, silent agent comes to Washington D.C. to handle a distress call from fellow Division agents. 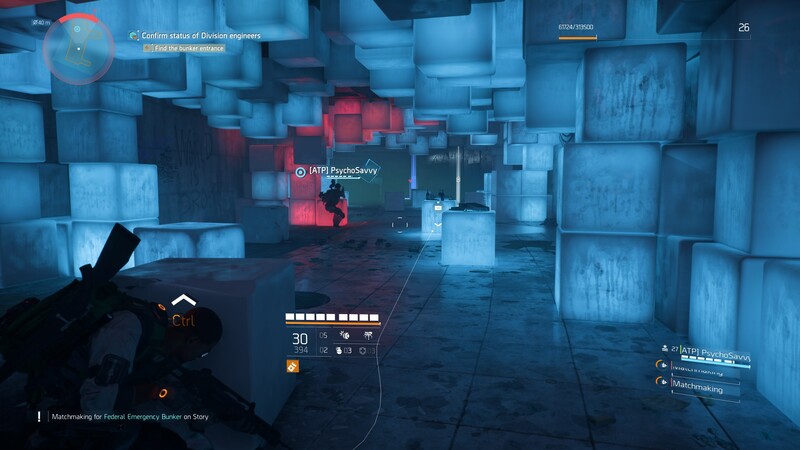 You find a city under siege as New York was, with the national SHD (Strategic Homeland Division, pronounced "Shade" in-game) network that connects The Division across the United States down for the count. Oh, and the President has been kidnapped by one of the main factions. It's up to you to fix the problem by strategically shooting folks until everything is better. Yes, there's a narrative layer to The Division 2. At one point I was supposed to be looking for Division Agent Kelso, a story campaign objective that was pushed to the back of my mind. When I remembered about it a few missions and cutscenes later, I realized that I had already found Kelso and gotten my marching orders from her. There are other characters, like the leaders of the two D.C. settlements, where civilians stay, but they feel more like window dressing of player progression. In fact, most of the time you'll miss the scant story available because you're busy messing with loot or doing character building. The Division 2 also tries to set up a looming threat in the form of rogue agent Aaron Keener, who taunts you cryptically via audio logs. Unfortunately, I'm not entirely sure why I should be afraid of Diet Hannibal Lecter at this point, because he never makes his physical presence felt. The entire story campaign ends with the President offering his own Independence Day-style speech about hope and banding together, but at no point did it feel like The Division 2 was trying to say anything meaningful. There's no real themes to hang your hat on here, outside of "hope". If you're looking for a robust tale of intrigue, adventure, and sacrifice, The Division 2 isn't it. It's fluff, but as I tore my way into World Tier 4, I found none of that really mattered because I was still enjoying myself. 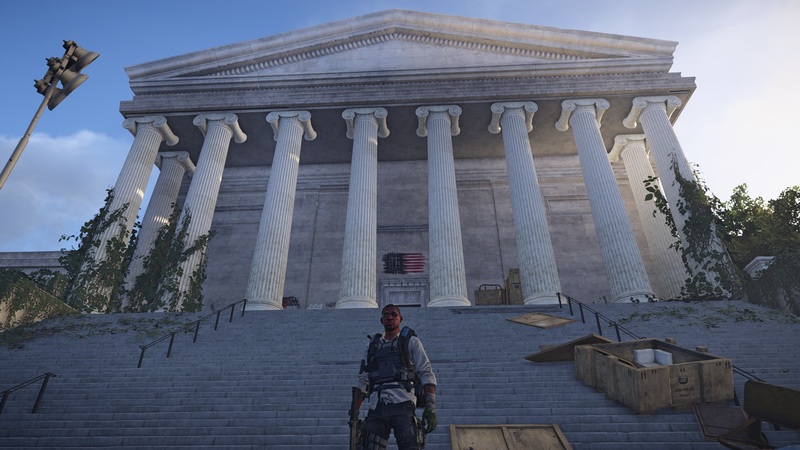 The Division 2's setting might only be Washington D.C., but it's a wonderfully realized version of the city. Ubisoft has long had the expertise to recreate whole eras, and here that expertise is turned towards reimagining an existing city. Washington D.C. isn't just littered with the remnants of civilization, like stalled cars and Metro buses; the wildlife has taken over in many spots. Swamp waters have risen in several areas, ivy and shrubbery have overgrown with no one to stop their march. Trash has decayed and stagnant pools of water are everywhere. There's a grit to The Division 2's D.C., a strong feeling of the wilderness, of being forgotten. Amid this tangle of wilderness are familiar landmarks. Pennsylvania Avenue, just off of the Federal Triangle Metro stop, is a place I've been a number of times over the years, and it's reproduced rather well in The Division 2. I know the FBI Building by sight, and to see it hollowed out like it is in The Division 2 is haunting. When I step down into the Metro, those curved pocketed stones are instantly recognizable to me; they're usually an indicator to me that TV shows and movies supposedly set in D.C. weren't actually filmed there. And your base of operations is the White House itself, a once esteemed hallmark of the best America (depending on how you feel! ), now a rotting ruin filled with the dead and slowly dying. Being so close to the real place, I feel the loss Ubisoft is trying to establish here. Ubisoft has filled every corner of The Division 2's D.C with something. There's always a pocket of Hyenas to shoot, a control point to take, or a side mission to tackle. You'll find small incidental loot everywhere, whether that's resources for your outposts like water, or loot for yourself. There are Echoes, holographic recreations of life before the disaster, and recordings, small audio logs that cover the same ground or give you insight into current threats. You want to explore because there's usually at least something at the end of every branch. Often you'll find a case or trunk with a new weapon, some new armor, or a new hat to put on. You'll end up in unique corners of the world hunting a bounty. Exploration in games doesn't just matter because it's something to do, developers also need to incentivize you to poke around the world. 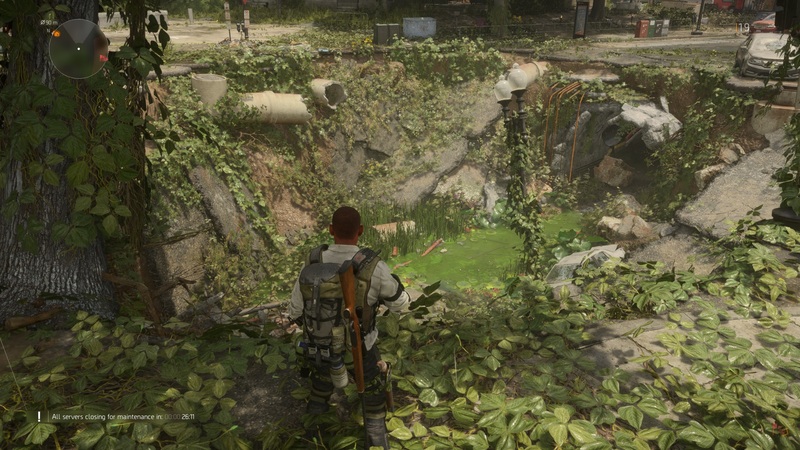 That's part of what makes The Division 2 flow; there's always something new to discover. The Division 2 showers you in loot. It's not like Diablo 3 or Path of Exile, where loot is constant; it's a more consistent cadence. Every few minutes, you'll get something new, especially if you're paying attention and diverging from the beaten path. There's a variety to the loot. I don't understand every system, but there are a number of considerations to just your weapons. How much damage per bullet do you want to do? Are you worried about reload speed? Do you prefer to handle enemies up close, or at a distance? Do you favor automatic weapons, or do you prefer to spit fire every time you click the mouse? For neophytes, worrying about the big three statistics (Damage, Firing Rate, and Magazine Size) is enough. For veterans, there's way more under the hood and this only expands once you're level 30. 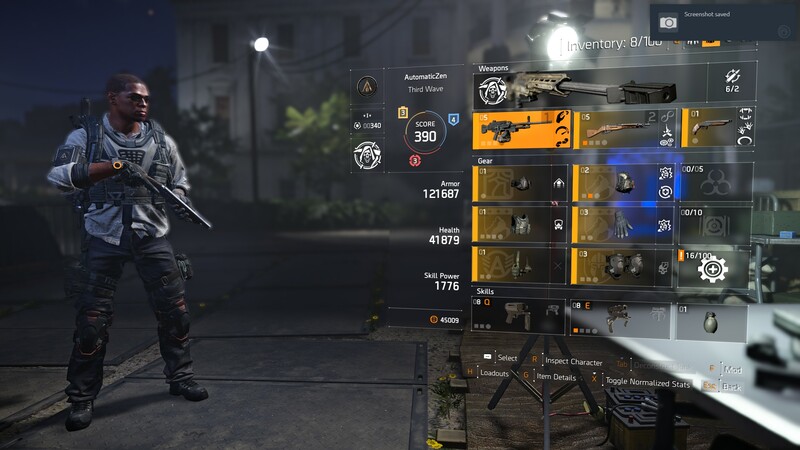 At that point, The Division 2 converts over to a gear score system instead of a strictly level-based one. And the weapons feel very different, from both a play and sound perspective. The crack of a bolt-action rifle is different from the boom of a shotgun, or the drumroll of the light machine gun. You'll find yourself settling into certain firing rates, choosing weapons that fit your playstyle. If you're very aggressive, then a shotgun and light machine gun is for you. If you hang back like me, you want to stick to marksman or sniper rifles. Those under the hood stats I was talking about, with graphs and numbers for damage drop offs and critical strike ranges, begin to become more important to you. I don't know the difference between a M870 Express, Classic RPK-74, or MK16 in real-life like some military buffs, but I've quickly realized I prefer weapons like the Military M416, because it feels satisfying to me. There's also a great deal of customization available. You can quickly unlock mods, which include scopes and magazines, and enhance features like your weapon's range and critical strike magnitudes. Once unlocked, mods can be turned on or off for your weapons, pushing them towards different capabilities. Some weapons have additional talents, which confer more bonuses without drawbacks, but they remain specific to those weapons. This means sometimes you'll hold onto a weaker weapon because it's carrying a talent like Salvage, which makes enemy kills have a 50 percent chance to refill the weapon's magazine. And eventually you unlock recalibration, which allows you to move bonuses from one weapon to another. Together, item crafting and recalibration allow you to build directly towards your preferred playstyle at endgame. You'll probably be worried more about gear score instead of getting the perfect build until you get to World Tier 4, the current maximum of The Division 2. I'm a little less jazzed by some of skills, additional weapons that push players into different categories. I enjoy the idea: there are a total of eight different skills, including automated turrets, seeker mines, riot shields, and autonomous drones. Within each skill, there are various types, so you can have a drone that hunts down enemies or one that heals your allies. It's a good idea, but some of the skills are a bit fiddly. The Chem Launcher, for example, not only feels hard to select and use, the sticky bomb version of it doesn't feel like it lasts long enough for me to capitalize on the ability. Meanwhile, the Turret is pretty useful, but throwing it in the heat of battle sometimes feels like a fool's quest, leaving it in odd places or behind cover where it can't hit any enemies. A lot of the skills are great—I go with the Sniper Turret and Seeker Mine—but some of them need work. Ubisoft Massive said they had an "endgame first" mentality with regards to The Division 2, and it shows. They've built in layers to the experience, so as you work your way to level 30, the World Tiers 1, 2, 3, and 4, the game itself shifts to accommodate your growing expertise. You begin with finishing main missions and various open-world tasks like taking control points, stopping public executions, or grabbing supply drops. You'll slowly unlock new systems like crafting, the PVP-focused Conflict mode, or the Dark Zone. 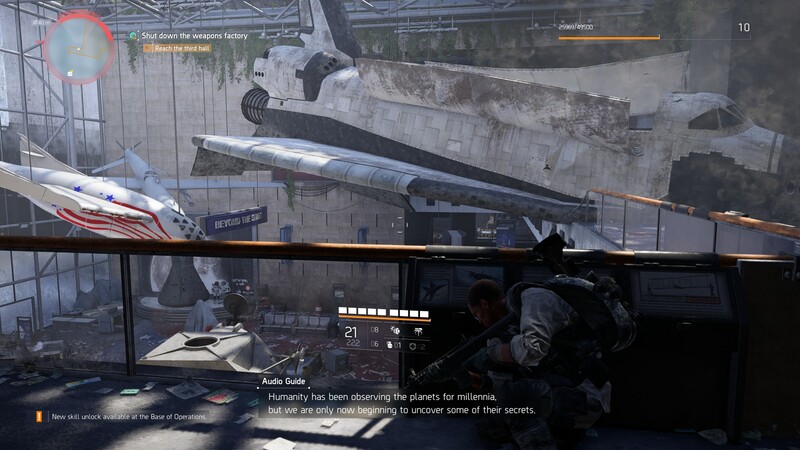 At around level 15, The Division 2 unlocks new open-world tasks like Resource Convoys, friendly or enemy groups that wander the map. Then towards the end of the leveling experience, the faction Strongholds become available to you and beating all three kicks you in World Tier 1. Here, you gain three Specializations: Survivalist, Demolitionist, and Sharpshooter. EAch specialization comes with a signature weapon. The Survivalist is about healing support and controlling the environment, the Demolitionist is straight shock and awe, and the Sharpshooter is all about long-range murder from cover. 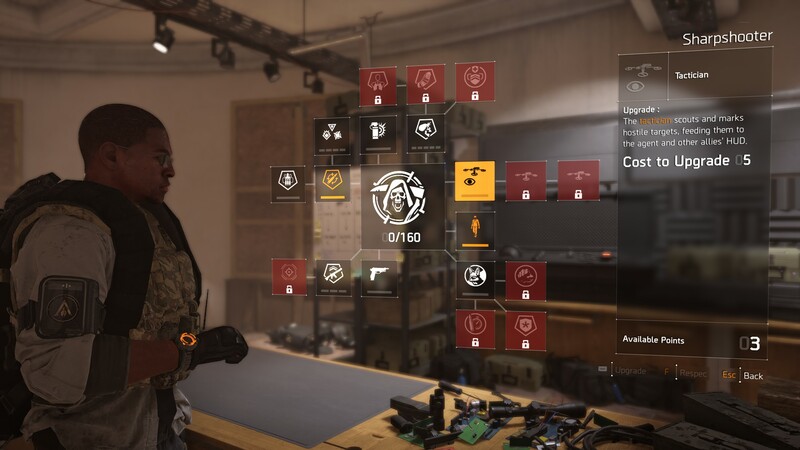 As you dispatch enemies and complete missions with that specialization active, you gain points to spend in a specialization-specific skill tree. Their signature weapons are powerful, but the ammo doesn't always drop; more important for your overall playstyle are the skill trees. You would think that the leveling experience here would be repeating the strongholds until the end of time, but that's not the case. Instead, all of your control points and the existing stronghold are taken over by a new faction, the Black Tusk. They bring high technology like drones and robotic dogs, together with more varied engagement tactics. Main mission areas become invaded, with changed encounters and rejiggered paths through the levels. The three strongholds become invaded as well, and beating one takes you up to the next World Tier. Control Points become dynamic targets that you have to defend against attacks, and at the highest World Tier they get Alert Levels, becoming even harder as you complete open world tasks around them. Elites and hunting drones spawn more often in the open world. The Snitch appears, offering you harder bounties if you can find him, or you can grab some elite named enemies from the Priority Target Network. And on, and on, and on. The Division 2 works so well because the experience shift and changes with you. You become better, so it throws more unique tasks in your direction, challenging you to be better, to min-max your character build, to specialize. Every level range and world tier changes how The Division 2 reacts to you. I admit that once you coast into World Tier 1, the open world becomes far more dangerous and I'd say, a bit too overcrowded. I wrote an article about The Division 2's difficulty when you're playing solo. Enemies can absolutely tear through your armor and health if they get to you, and this only becomes worse later on. At World Tier 1 and above, you can frequently be taking on one task, only to find about generated task intersecting. In one case, I had almost finished wrapping up a control point—a 10-15 minute protracted engagement—only for a hunting drone and elite patrol to come in behind me. Since enemy damage is high and their aim is perfect, the act of simply repositioning meant I quickly died with no chance to strategically react. If you're playing alone, you will die, and sometime it can simply feel like it happened because of the luck of the draw. And if you were worried about the idea of "bullet sponges," enemies that simply require you to drop a ton of bullets into them to make them drop, some enemies still fall into this category. Many have weak points that open them up to damage if you aim correctly, but some like the heavy gunners and sledgehammer users still have strong armor even after you hit their weak points. One or two heavy gunners in the midst of a larger enemy force can absolutely ruin your day, and Black Tusk heavies in tandem with sniping robot dogs is amazing frustrating if you're alone. Despite those issues, The Division 2 is a game I want to go back to because it feels good to explore and slowly progress forward. I'm always being rewarded for pushing forward, which should be the basic expectation of any loot shooter. Even the Dark Zone, which I avoided completely in the first game, is actually engaging for a PVE player this time around. The straight PVP of Conflict is less my cup of tea: it works okay, but the slower play of The Division 2 overall doesn't mesh well with PVP for me. My recent time with Anthem proved that a developer can definitely get this stuff wrong. Perhaps that's why I'm happy with the pure execution on display in The Division 2. Ubisoft Massive clearly looked at the first game and ask itself, "How can we improve this experience, all the way into endgame?" It's a testament to the flow and play of The Division 2 that I want to keep playing, despite the story being so lackluster and the real-world aesthetic not aligning to my tastes. The Division 2 is simply the looter shooter done right, and it stands as what other developers and publishers should look toward if they're trying to enter the genre in the future. Tagged with MMOs,	PC,	PlayStation 4,	Reviews,	Shooters,	Ubisoft,	Xbox One.